A disparate group of New Yorkers deal with personal relationships and varying issues over the course of a day. Person to Person, a film from writer\director Dustin Guy Defa, chronicles a day in the life of a cross-section of New York characters in a series of vignettes, as they navigate the choppy waters of work, play and relationships. The film opens with Bene, played by and based upon Bene Coopersmith, (director Defa’s best friend). Bene is a jazz enthusiast and occasional dealer in rare records. He receives a phone call saying that a man is offering to sell a hard-to-find vinyl copy of Charlie Parker’s Bird Blows the Blues. Donning a flashy new shirt (whose appropriateness he constantly frets over), Bene heads out on his bicycle to collect his precious disk, but not before urging his lethargic and depressed houseguest Ray (George Sample III) to get off the couch and at least go out for a walk. Music is almost a religion to Bene, and when he discovers he has been hustled by the vendor and the disk is one of several copies, he goes in hot pursuit of the perpetrator in a semi-comedic chase sequence through the streets, on bicycles, bent on teaching him a hard lesson about respect. Bene’s ardent devotion to music is conveyed by means of the lively soundtrack. Elsewhere, Tavi Gevinson plays Wendy, a pixie-cut, sexually ambivalent, misanthropic teen. ‘Angsting’ and whining throughout, she reluctantly accompanies her best friend, who insists that she join herself and her boyfriend throughout the day as a ‘third wheel’. However, the awkward situation of being surplus to needs unexpectedly introduces her to a boy nice enough to befriend…and possibly even experiment with. These characters, however, are peripheral to what might be viewed as the main storyline, in which a crime reporter, Phil (Michael Cera), brings Claire (Abbi Jacobson), a shy trainee, along on a job in an attempt to find out whether a woman is telling the truth about coming home to the scene of her husband’s suicide, or whether she might have murdered him herself and covered up the evidence. Integral to the discovery of the truth is the character of Jimmy (Philip Baker Hall), an elderly watch repairman who may possess a key piece of evidence in the murder investigation. He however, is far from willing to participate in the ‘whodunit’ shenanigans of the reporters and the cops. Instead Jimmy maintains a dignified silence in respect to the details of his client (the widow) when questioned by nervous newbie Claire. Phil keeps goading the unassertive Claire into risky situations, trying to impress her with the importance of his job and with his leadership skills, in the hope of scoring her as a new girlfriend. She gets the goods on the case, but can he get the girl? Shot on 16mm film, Person to Person radiates a vague nostalgia reminiscent of the misty, autumnal glow of Woody Allen’s New York, to which it owes a huge debt, as awkward, verbose, neurotic characters try to make meaningful connections in the day-to-day tumult of the Big Apple. 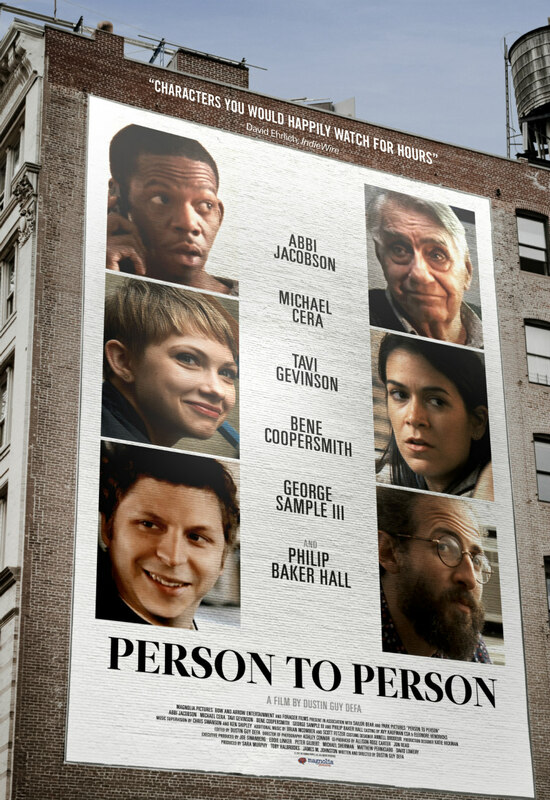 Person to Person is droll rather than laugh-out-loud funny, contemplative rather than satiric, and it is no love letter to New York or its inhabitants. It displays a wilful idiosyncrasy through a layer of ironic detachment, which leaves the viewer to judge the relevance of the experiences of its characters - rather like the protagonists themselves. Most of us are familiar with movies and TV shows chronicling the lives of young New Yorkers; they have been a mainstay of movies and TV shows for decades, thanks to the pervasiveness of its entertainment industry. Yet, somehow, watching this movie, coloured by the reality of recent events in America, these people, their language and their mores seem suddenly to reveal a certain remoteness. Perhaps we have less understanding of the American mindset than we imagined.